Grammatical Complexity in Academic English uses corpus-based analyses to challenge a number of dominant stereotypes and assumptions within linguistics. 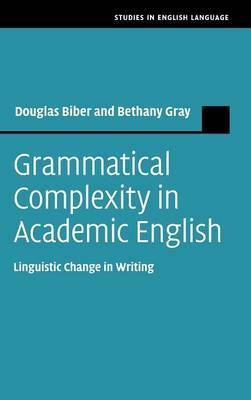 Biber and Gray tackle the nature of grammatical complexity, demonstrating that embedded phrasal structures are as important as embedded dependent clauses. The authors also overturn ingrained assumptions about linguistic change, showing that grammatical change occurs in writing as well as speech. This work establishes that academic writing is structurally compressed (rather than elaborated); that it is often not explicit in the expression of meaning; and that scientific academic writing has been the locus of some of the most important grammatical changes in English over the past 200 years (rather than being conservative and resistant to change). Supported throughout with textual evidence, this work is essential reading for discourse analysts, sociolinguists, and applied linguists, as well as descriptive linguists and historical linguists.